What would the Cape Town Art Fair be without artists? This city has exceptional art pool of talent and the Cape Town Art Fair is where you can see a huge selection of art … in one space. Visitors to the design fair, GUILD can take home a piece of collectible design from the expertly curated ARTISAN exhibit, where you can buy handbags, jewellery, crockery and more. (Cape Town Art Fair: The Pavilion, Dock Road, V&A Waterfront; 28 Feb–02 March). 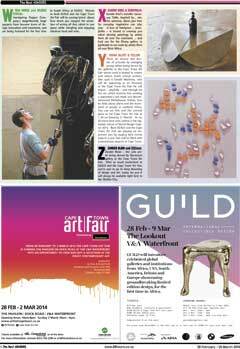 GUILD: The Lookout, V&A Waterfront; 28 Feb – 09 March). B: BRAZILIANS & BOOK SIGNINGS. Bringing its evocative design to our shores, ColetivoAmor De Madre will be at GUILD showcasing what’s making waves in Brazil right now. Artists Brett Murray – most noted for his Spear painting of Jacob Zuma, Jan Neethling, Anton Kannemeyer and Conrad will be at the Cape Town Art Fair on Saturday to sign books – and the books will be on sale at all times. Prof Andrew Lamprecht is curating the Cape Town Art Fair. He has lectured Theory & Practice of Art at Michaelis since 1998 and currently convenes the Discourse of Art major as well as Theory & Practice of Art III & IV. Invited Curator Ernestine White is South African artist and curator whose decade of experience in the arts and culture sector spans two continents. Let the children join at GUILD! They’ll love the Origins Centre walkabout exhibiting the first objects made by man 100 000 years ago, and stone knapping demonstrations on Sunday 2 March. Africa’s loudest design voices come together at GUILD under the title of Design Network Africa under one roof. They will be exhibiting everything from furniture and textiles to ceramics and jewellery. The Caviar Group, Boss tea, Illy coffee and Perdeberg Winery and more will be at the Cape Town Art Fair to serve visitors a sumptuous offering. E: ERDMANN, EVERARD READ and ELION. Leading galleries – Erdmann and Everard Read, along with Goodman, Stevenson, 34FineArt, SMAC, Whatiftheworld and many others (too numerous to mention here) – will be at the Cape Town Art Fair showing their finest artists’ works and helping visitors to appreciate what’s on display and more. Artist Michael Elion has created a rainbow (it’s real!) on The Lookout deck. It will be one of the highlights on the GUILD’s opening night. chairs will be on display in Rossana Orlandi’s exhibition space. Come and meet this doyenne of Italian design at GUILD. 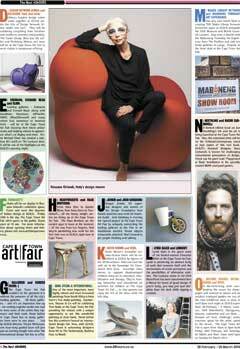 Friday 28th is the day The Cape Town Art Fair 2014 opens to the public. Doors open at 10 am. For more information about opening times and tickets, please visit www.artfaircapetown.co.za. The Cape Town Art Fair wouldn’t be the spectacle it is without the presence of all the city’s leading galleries. All these galleries – and it’s an impressive line-up – are coming together under one roof to show some of the artists they represent and their work. Never before in Cape Town has so many galleries been seen in one place. Led by GUILD director, Trevyn McGowan, one hour-long guided tours will give you an exciting insight into what this international design fair has to offer. 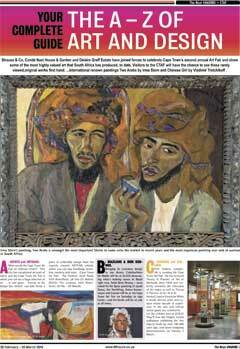 From Asha Zero to Zander Blom, from Irma Stern to Tretchikoff…. all the heavy weight artists are lining up at the Cape Town Art Fair. The Haas Brothers are the coolest guys in town at the moment – all the way from Los Angeles. And they’re premiering new work for the first time ever at GUILD, right here in Cape Town. 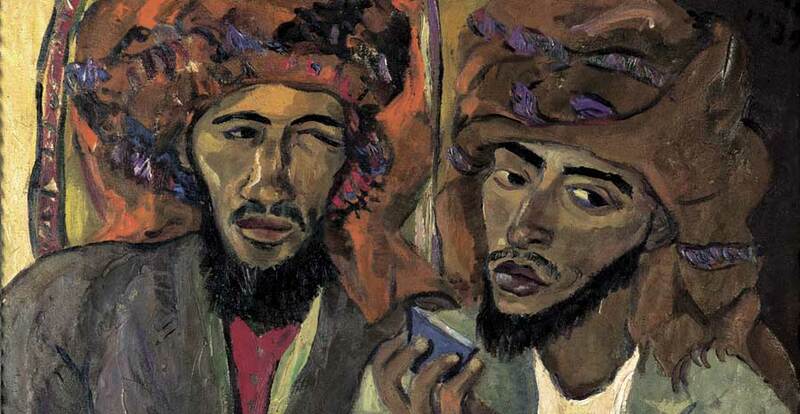 One of the most important, most highly valued and most renowned paintings from South Africa is Irma Stern’s Two Arabs painting. Auctioneers, Strauss & Co will be exhibiting Two Arabs at the Cape Town Art Fair providing the visitors with a unique opportunity to see this wonderful painting at close hand. Never before has this continent hosted an international design fair. Now, with GUILD, Cape Town is welcoming designers from NY to The Netherlands, Burkina Faso to Brazil. Gregor Jenkin, SA superstar designer and winner of the Design Foundation Icon Award, launches new work for Southern Guild. Josh Ginsburg is creating the ‘special project’ at the Cape Town Art Fair by uniquely connecting the leading galleries at the Fair in an installation entitled ‘found objects temporarily attached’ that’s bound to get people thinking and talking. Keith Brown’s incredible science-fiction forms will be exhibited at GUILD by Agents of the 3D Revolution. Kids can have fun with art in the Sovereign Art Foundation Kids Zone. Sovereign raises money to support disadvantaged children using art as education, rehabilitation and therapy. They’re hosting interactive and educational art activities for children at The Cape Town Art Fair … so that parents can enjoy the rest of the show while the kids play. Lyndi Sales is the guest artist of the invited curator, Ernestine White at the Cape Town Art Fair. Lyndi is presenting an abstract body of work that concerns itself with the mechanisms of ocular perception and the possibilities of alternative realities. The Lookout venue at the V&A Waterfront has been transformed into a Mecca for lovers of good design. If you’re lucky, you may just spot dolphins from the deck while sipping a cocktail. Our very own Heath Nash is curating THE Maker Library Network interactive space at GUILD alongside the V&A Museum and British Council, London. Hop onto a shuttle with the Maboneng Township Art Experience from The Pavilion and visit ten home galleries in Langa. Enquire at the front desk at the Cape Town Art Fair. A limited edition book on Jan Neethling’s life and his art is being launched at the Cape Town Art Fair. Also, this esteemed artist will be on the ErdmanContemporary stand to sign copies of this new book. GUILD’s featured designer, Naco Carbonell, is known for challenging conventional perceptions of design. Check out his giant scale ‘Playground at Dusk’ installation in the specially created BMW courtyard garden. A 48-metre-long deck overlooking the ocean for champagne and seafood at sunset and an outdoor courtyard garden are two of the four exhibition areas to relax in until 8pm each night at GUILD (open from 28 February – 9 March, Lookout, V&A Waterfront). Outrageous, obscure, outlandish and out there … because art must challenge; evoke emotion; speak for the artist; speak to the viewer. The Cape Town Art Fair is open from 10am to 8pm both Friday 28th February and Saturday 01 March and from 10am until 6pm on Sunday 02 March 2014. What queue? Book ahead for GUILD and the Cape Town Art Fair through Computicket and buy either individual tickets or a joint one for the both shows for only R120. And then, once you’ve been inspired and uplifted by all the wonderful art and design on show, you can retreat to a quiet place of contemplation and consider how your discerning powers will take root in the future. New York’s trailblazing gallery is showing over 80 works from the likes of glass artist Jeff Zimmerman to David Wiseman, whose nature-inspired pieces will transport you to a fantasy world. All the art you’ll see at the Cape Town Art Fair is genuine and original. The Fair presents the best chance of seeing superb original, contemporary artworks – much of which will stand the test of time – by some of the best artists in Africa. Cape Town Art Fair’s hotel of choice for all its VIPs and artists). Having made a name for itself as the country’s go-to collective for the top names in South African design, SOUTHERN GUILD has got some of our favourites on show –Dylan Lewis, Bronze Age, Conrad Hicks, John Vogel and Andile Dyalvane, to name a few. Tasha’s will have a restaurant at GUILD, so there’s no need to rush home. View, eat, and view some more. Said to one of the most widely reproduced and instantly recognisable images in the world, Chinese Girl will be on show at the Cape Town Art Fair. 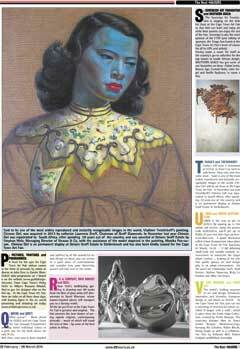 In November last year Tretchikoff’s Chinese Girl was repatriated to South Africa, after spending 59 years out of the country, and is on permanent display at Delaire Graff Estate in Stellenbosch. UBER is the way to get to GUILD. By signing up to this online cab service, using the promo code GUILD2014, you’ll get up to R200 off your first ride! Sign up here: www.uber.com. A panel discussion called Urban Acupuncture takes place at the Cape Town Art Fair (Saturday 01 March, 16:30 – 17:30) debating small-scale but socially catalytic interventions to transform the larger urban context … looking at the role that public spaces, art and design play in an urban environment. On the panel are Christopher Swift, Andi Norton, Siphiwe Ngwenya, Ricky Le Gordon and Mike van Graan. Handspring Puppet Company’s magnificently huge puppets have become icons of design innovation and movement, and are being featured for the first time in South Africa at GUILD. Visitors to both GUILD and the Cape Town Art Fair will be waxing lyrical about how much you enjoyed the sensation of seeing all that talent in one space while mingling and enjoying fabulous food and wine. Xandre Kriel’s metallic Samoosa Table, inspired by… um, the samoosa, shows just how far everyday inspiration can take you. A love of foreigners – xenophilia – is bound to envelop you when viewing paintings by artists from all over the continent … and look out for the Ebony gallery in particular to see work by artists from all over West Africa. There are dozens and dozens of artworks by emerging young artists being shown by the galleries at the Cape Town Art Fair whose work is bound to inspire and attract much critical acclaim. One such is Gerald Machona, who will be appearing as an Afronaut at the Cape Town Art Fair. He will depict – playfully – and through his live art, which involves him wearing a spaceman’s suit made out decommissioned Zimbabwean Dollars, how he feels about aliens and the movement of people in southern Africa. You can see him and this seminal piece at the Cape Town Art Fair at 1.30 on Saturday (1 March). As we all know have seen, yellow is the signature colour of World Design Capital 2014. Both GUILD and the Cape Town Art Fair are playing an important part by staging their events early in a year that will be filled with extraordinary projects in Cape Town. Zander Blom – the solo artist being shown by Stevenson gallery at the Cape Town Art Fair. After so much excitement at GUILD and the Cape Town Art Fair, you’re sure to go to sleep dreaming of design and art. Lucky for you it will always be available right here in the Mother City.